I am constantly amazed at how sweet Bella is. She is thoughtful and sincere and genuinely compassionate. * When I do something like stub my toe, she will demand "which toe?" and go get an ice pack. She loves to setup Emily with lots of toys, which Emily typically throws aside so she can crawl around and eat sock lint, and Bella will run around, "She needs fresh toys!" gathering different toys. At preschool they wrote down what each kid said they wanted to be when they grew up and Bella was the only one who said "a momma." Awwww. I realize this is probably a big sister phase, and the clock is ticking before the crazy I-hate-you-all-and-I-want-a-cell-phone tweenager phase kicks in. But for now, let's savor the sweetness. I thought a good way to encourage her compassion and thoughtfulness would be to have her help me volunteer. So I did a little searching around for good pre-school volunteer opportunities, and found a bunch of great ideas. 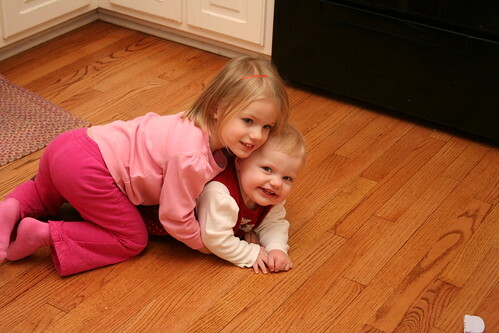 When both girls are older, there will be a lot more "on-site" opportunities, but for now I stuck to the at-home things. Minnesota Visiting Nurse Agency has many ideas for "kits" you can shop for and assemble at home and bring to their offices for their home-visit nurses to bring when they visit low-income families. The one that I think would be most interesting to Bella is the "Rub a Dub, Safe in the Tub Kit." It includes baby towels and washcloths, baby wash/shampoo, wipes, diapers, diaper cream, a bath toy, and some onesies. Lots of fun things to put together! And don't you love thinking of a little baby having fun in the bath, all clean and splashy? There is nothing cuter than a baby having fun in the bath. Another donation idea they gave was that they are always in need of books. Because, they say on the website, 95% of the households they work with do not qualify as what they consider "literary homes," which means they have less than 12 books in the house. IN THE WHOLE HOUSE. I realize I am sheltered, but OMG. We have like 1200 books. My heart just broke. Habitat for Humanity cookie baker! How fun is that idea! We love to make cookies. And apparently Habitat for Humanity likes to deliver cookies to job sites to reward volunteers. But we would just deliver them to the main office, so that's easy enough. Chemo Angel. Kind of a heavy subject for a little kid, so I'm going to dumb it down: sick person needs cheering up. I think at a basic, non-cancerous level, this is the kind of personal mothering activity that Bella is drawn to. And since it is all through the mail, it is pretty non-threatening. I think she'll be a wonderful chemo angel assistant! So those are my ideas for my sweet little girl. I'll let you know how they go! *Just to be clear, Bella has her moments. Two nights ago she screamed like a banshee and shouted "I AM SO ANGRY! AND FRUSTRATED! AND NOW I AM SAD!" (she will continue adding emotions--scared, lonely, thirsty--for as long as they keep surfacing) all because I had put her stool in front of the sink to brush her teeth. But it was the wrong sink! I AM SO ANGRY!